J-Novel Club Forums | Omae wo Otaku ni Shiteyaru kara, Ore wo Riajuu ni Shitekure! Kashiwada Naoki is closet otaku. After hearing how girls bad-mouthed him behind his back including his crush, he decided to go all secretive about his hobbies. One day, the bishoujo, loli-like gyaru Koigasaki Momo found this truth by mistake. Momo loves the handsome Suzuki, who turns out to be a huge Otaku. Noaki teaches Momo how to be Otaku and Momo teaches him how to be Riajuu and get closer to his crush. -How embarrassing MC is, he makes many mistakes that are based on author's dark history. Man, I almost shouted at the guy, "no, no, nooo, nooooo, don't do that" while laughing. -How self aware the series is. In the very 1st volume, MC mentioned the trope of people who help each other fall for each other (like Toradora) and they said they will be an exception. This does seem like one of those typical LN about Non-otaku and otaku. but we do not really have any series like that so you have my up-vote. also it is complete too witch is a big plus in my books. Can we please have it required to mention the English translated title at least somewhere in these submissions? Some things don't have easily translated English titles, so they just keep the Romaji, even on Novel databases. "I will make you a geek, so please leave me all over" (...yeah). @bloodygaikotsu I'm reading this thinking "this sounds like Toradora for otaku and then you mention they're aware of the trope. This ticks a lot of boxes for me, like @the-green-death listed. This is not one of those cases. "I'll Make You an Otaku, so Please Make Me Popular!" is a pretty low-effort translation of the title but it still is almost flawless as far as translations go. The novel databases don't use that as the lead title (it's hidden under "other titles"). I dunno why. Just isn't popular? Most of them aren't translating Riajuu to "popular person / popular" either, they're just keeping the Romaji for Riajuu and Otaku. 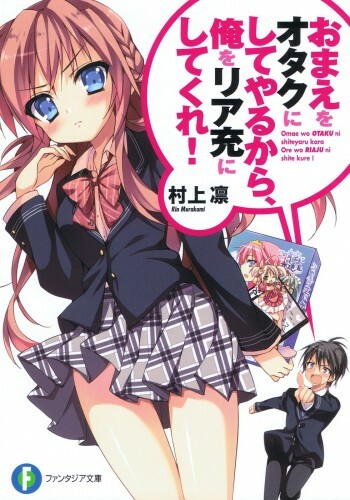 Novel Updates translates Riajuu as "normal person" for the English version of the title. I'd definitely prefer to have English titles, but it also makes it more likely for us to get repeat threads if people are searching for the more popular Romaji, seeing no threads, and posting a new thread. I never typically pay attention to the Romaji, don't usually use it myself, so I know this'll happen to me in the reverse (searching for the English / Japanese characters and seeing nothing) and to others with my use of English titles. Probably because there's no official English title. Anyway, I was just responding to your specific statement, about "easily translated English titles." Yes, a lot of titles have wordplay or are weirdly long because Japanese allows crazy run-on sentences, but this one is not one of those. "Riajuu" might have some debatable options, but, as far as overall translation complexity goes, it's extremely straightforward. I usually write the English title if it exists and people actually use it, like "The Tatami Galaxy" where people are more used to English title. Some of the titles I requested have no English translation at all. So, to mention English title, I have to translate it myself, but you will never it such translation on any other database site. Yeah, this is interesting enough for me to give an upvote. Being complete at 10 + 6 volumes is a nice plus. Kind of curious what the after stories are like; I like the idea of throwing a couple of extra stories after completing the main storyline.